It’s okay to struggle. David was called a man after God’s own heart. He definitely wasn’t a perfect person, but he knew that regardless of his sin or his feelings, God was unchanging. He would cry out to God “How long?” and beg for deliverance, but then he would acknowledge that the Lord heard him. He was honest about his struggles, but he always followed it up with trusting God: “The LORD has heard my plea. The LORD accepts my prayer” (Psalm 6:9 ). David’s example shows us how to be honest about our struggles and feelings while also trusting God regardless of them: “But I have trusted in your steadfast love; my heart shall rejoice in your salvation” (Psalm 13:6). Remembering what God has done for us in the past can encourage us when our present circumstances are hard. Every time David struggled, trusted, and overcame he had one more memory of God rescuing him. We often see David reminding himself of what God had done for him in the past to encourage himself that God would do it again. I love journaling, and I have a shelf of my journals filled with detailed prayers and notes that cover the past 15 years of my life. I’ve found the number one benefit of journaling is being able to go back and read how the Lord has helped or blessed me in the past, especially when I’m feeling depressed or struggling in some way. I can see His comfort and support through deaths, relationship struggles, financial difficulties, physical hardships, and emotional distress. Rereading my journals gives me hope that God will bring me through any current struggles I am facing in the same way He has in the past. God is always worthy of our praise. Regardless of our feelings or circumstances, God is with us, and He still created everything around us. The beauty of nature should bring us hope and remind us that He is still active and moving! He gives us every day, every breath, and every relationship we currently have, and the existence of these things are daily reminders that He has not forgotten us. Every single time David complains or worries to God, he also voices thanksgiving, trust, and awe at what the Lord has done. “O LORD, our Lord, how majestic is your name in all the earth! You have set your glory above the heavens” (Psalm 8:1). Praising God through hard times can help put our problems into focus and shift our perspective. God is big and doing big things beyond us, but we are still important to Him. NOTHING can separate us from God. When David committed adultery and had Bathsheba’s husband sent into battle to die, he turned to God, “Create in me a clean heart, O God, and renew a right spirit within me” (Psalm 51). When he struggled with feeling alone and depressed, he turned to God, “Send out your light and your truth; let them lead me; let them bring me to your holy hill and to your dwelling!” (Psalm 43:3). David trusted that the Lord would renew a right spirit in him after he sinned, and he trusted that the Lord would shine light into his downcast spirit. No matter what, David was continuously crying out to God with a trusting spirit because that is what a man after God’s own heart does. Imperfection, sin, and depression do not separate us from God; even feeling distant from God does not separate us from Him. God doesn’t want us to be perfect, He just wants us to trust Him and glorify Him. David shows us how to keep our eyes on God through all of life’s ups and downs. “I lift my eyes up to the hills. From where does my help come? My help comes from the LORD, who made heaven and earth. He will not let your foot be moved; he who keeps you will not slumber. Behold, he who keeps Israel will neither slumber nor sleep. The LORD is your keeper; the LORD is your shade on your right hand. The sun shall not strike you by day, nor the moon by night. The LORD will keep you from all evil; he will keep your life. The LORD will keep your going out and your coming in from this time forth and forevermore” (Psalm 121). Growing up, I loved Christmas Eve. We would gather at my grandparent’s house before dinner. Everyone was off work and life seemed to just stop for a bit. We enjoyed a good meal, took time thank Christ for what Christmas was really about, and opened presents from my grandparents. I especially loved that both of my parents were there—no work to think about…just time to sit and relax and be with family. Fast forward to Christmas Eve now. Four years ago, we moved to Arkansas where my husband serves on staff at a church. Every Christmas Eve, we have a service in a barn. It is really neat to gather in a barn and such a tangible way to share the Christmas story. But, this means A LOT of work and preparation. We bring in a small stage, set up lights, chairs, heaters, tables for hot chocolate and cookies, etc. After the service is over, a lot of time is also devoted to clean up and my husband usually doesn’t get home until after kids are in bed. Last year, I left the Christmas Eve service with our three children by myself. I remember driving home on the unfamiliar roads and I took a wrong turn. I was trying to navigate my way back to familiar roads and I just started crying. I felt so silly, but I just wanted to all be together on Christmas Eve and knowing that would not happen as long as we had our Christmas Eve service was upsetting. I came home to an empty house and began getting the kids something to eat. I was having a full-out pity party because things were not the way I wanted them. This is life, though, isn’t it? Things change and things are not always the way we envision. As I think back to the night of Christ’s birth, I’m sure things were not as Mary planned. Who would envision giving birth in an unfamiliar setting, let alone in a stable because no rooms are available? But Mary saw past her circumstances because this night was not about her—it was about the baby she was carrying. This child was born to die for us, to carry a burden we could not carry and to give us new life. What if we looked beyond our circumstances to the greater good? Our Christmas Eve may not be glamorous or what we envisioned. Perhaps you are stuck at home with a sick child or you have to work or you are alone with kids because your spouse has to work. But it’s a chance to change our perspective to see what God wants to do in our hearts tonight. How can you take what you’ve been given and use it for the greater good? So tonight may not look like it used to look for me on Christmas Eve. But that’s ok. Because tonight we get to celebrate in a barn with others who may not come to church otherwise. We get an opportunity to hear a message and turn our hearts to the real meaning of Christmas. I pray that you can find this same hope as you have your Christmas Eve-: that God would use you to love on your children or to wipe another sick child’s nose or to encourage your husband as he works the night shift. I’m so thankful for Christ’s sacrifice—that He saw past His comfort and chose to come down as a helpless baby to save us. Have you ever felt completely inadequate or unprepared? If you a parent, you might answer that question by shouting, "EVERYDAY OF MY LIFE!" The fact is raising a family is one of the most rewarding and yet challenging experiences in all of life. It's easy to become overwhelmed in the process and to loose sight of the things that are most important on the journey. Thankfully, God reminds us in 2 Corinthians 12:9, "My grace is all you need. My power works best in weakness." On Father's Day, Northwest Community Church will launch our summer teaching series called Win, Coach, & Release. We will dive into Scripture to discover God's principles for healthy relationships in the home and see how those same lessons transfer into all the other relationships in our life too. We will discover that the goal of parenting is not simply to survive. Rather God wants to see parents win, coach, and release the heart of their children into a world that stands in need of their leadership and influence. Our prayer during Win, Coach & Release is that God will show us His perspective on parenting so that all the families connected to Northwest would learn how to thrive and display God's goodness in their community. These next 7 weeks could easily change the path of your entire family's future. Invite a friend or neighbor to come with you and don't miss out on this incredible opportunity! "What do you want? Ask, and I will give it to you!" Imagine if God asked you that question. How would you answer? Would you ask God for wealth? Better looks? More influence or popularity? Maybe true love? In 1 Kings 3:5-15 God asks that same question to a man named Solomon. We are privileged to see the way Solomon responded because he answered the question exactly right! And as a result, God allowed Solomon to experience the momentum of the wisdom flywheel as a young leader. Instead of being motivated by selfish desires, Solomon asked God for an understanding heart, for wisdom, and for discernment in leadership. It was a request God was thrilled to answer! Then in 1 Kings 4-10 Solomon serves as one of the greatest examples of godly wisdom and effectiveness in human history as the wisdom flywheel began to turn. This week reflect on Solomon, the Wisdom Flywheel, and 1 Kings. Download the connect sheet, and experience God-fueled wisdom and effectiveness. To learn more about the Wisdom Flywheel and how you can experience it in your own life be sure to listen to this week's podcast and make plans to join us this Sunday at Northwest for week 2 of the Way of Wisdom. Have you ever felt like you were in over your head? I can definitely recall a few times in my life. Seeing Sarah walk down the aisle towards me at our wedding, holding each of our 3 daughters for the very first time, and deciding to launch Northwest Community Church would all be near the top of my list. In those types of situations, your next move is critical. In fact, your next move will often determine your path for years to come. When you are in over your head, do you rely on blind luck? Or do you pursue true wisdom? 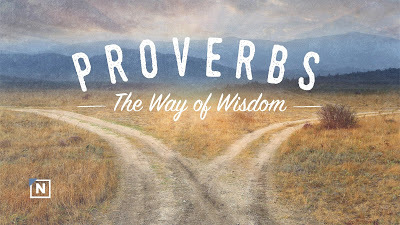 On Sunday, April 15th Northwest will begin a new teaching series on the book of Proverbs. For the next 8 weeks we will study the way of wisdom and the path it takes us down in the major areas of life. Don't miss out on this incredible opportunity to prepare for the next time you encounter a situation where it feels like you are in over your head! In fact, invite a friend or family member to come experience the way of wisdom with you. Remember Northwest Community Church meets in Cooper Elementary in Bella Vista every Sunday morning at 10am. Throw on a pair of jeans and come get a taste of what life is like at Northwest. Northwest is gonna throw a party and we want you and your family to be there. On Sunday, February 18th Northwest Community Church will celebrate our 8th birthday with worship, stories of life change, baptisms, and of course BBQ! As we celebrate God's faithfulness we are also going to look to the future and the vision God has given us for leading people to experience a new life in Christ. Living in light of God's faithfulness over the past 8 years, the Leadership Team has prayerfully developed some strategic facility goals for Northwest's future designed to better serve the needs of our church and community. 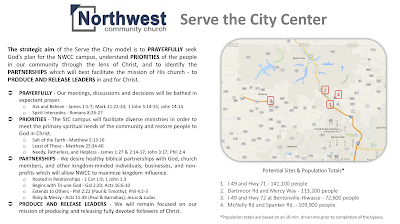 The strategic aim for the future Northwest campus is best summed up in the 4 P's of the Serve the City Center. The strategic facility goals for Northwest over the next 5 years are broken down into 3 broad categories: Short Range, Mid Range, and Long Range Plans. In order to pursue these strategic goals, the Leadership Team has initially asked the members of Northwest to generously and sacrificially give $100,000 to the Northwest Facility Fund in order to cover projected first-year costs for operating in our own facility. In light of God's faithfulness we trust that God will provide through the generosity of His people. There is a beautiful, biblical example of this type of process in Exodus 35 and 36 where Moses comes to the people of Israel with plans to construct the Tabernacle and asks the people to sacrificially give to the project. Once again, in light of God's faithfulness we believe God can supply more than enough.